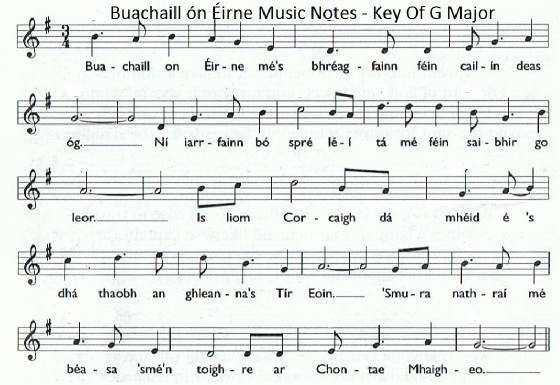 Buachaill On Eirne lyrics, guitar chords and sheet music notes. Tin whistle video included to help you learn the tune. A traditional song . by The Corrs. Remember that The Corrs were a folk group before they went pop, and it stood to them well, once you get ''The Ballad Bug'' it never leaves you. This song was recently recorded by Celtic Thunder. This tune was used for the song ''Come By The Hills''. The sheet music is in the key of G Major while the chords within the lyrics are in D.
There a very slight difference to the notes I'm playing on the whistle compared to the way the sheet music is written. If we all played a tune the same way life would be pretty boring. Make the song your own, play around with it and do it your way, but always remember to keep the main melody intact. The following notes are what I'm playing, the bold one's are the high D's and E's.